As is typical in the southern Mediterranean, Greeks eat late. Most dining establishments in Greece do not open for dinner until 9:00 PM. 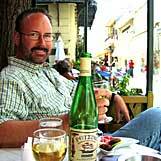 When eating out Greeks typically go to dinner around 10:00 PM, sometimes later in the hot summer months. Menus are always posted outside the door and in tourist areas establishments may have an outdoor host or "barker" to entice customers to eat at their restaurant. Waiters do not rush you or your meal. It is typical for Greeks to take a lot of time between courses socializing and enjoying the experience. The following are the different types of dining establishments you will find. Tavernas are the traditional Greek dining establishment. Food is prepared fresh each morning and served throughout the day. Grilled dishes, which are popular, are made to order. Local wine is served from the barrel. Dining rooms are usually small so outdoor seating is most common, either in a small garden, on the sidewalk or overlooking the sea. Tavernas usually do not serve desserts or coffee. 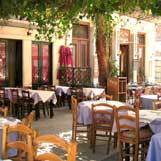 Restaurants (estiatória) are more expensive than tavernas and the menus include Greek as well as international cuisine. Wine is sold and served by the bottle, instead of from the barrel. And if you need a change of pace you'll find popular ethnic restaurants like Chinese, Indian, Mexican and Sushi Bars. Mezádhiko, Ouzádhiko and Tsiporádhiko (think hiko) specialize in appetizer plates that are to be shared by everyone at the table. It is most common to drink local spirits like ouzo or tsíporo with these dishes. Fast Food establishments are very popular in Greece, and I don't mean McDonalds, though they too are there. These can be as simple as a small door opening on to a street where food is served for take away, or someplace with only a few tables. The most common type of dish is the gyros (pronounced Hero but spelled yéros in Greek) sandwich which is made from spiced pork or lamb slices served in pita bread with tomatoes, onions and tzadziki (a sauce of sour cream, cucumbers, lemon and garlic). Also popular is souvláki, which is similar to gyros, but served on a plate instead of sandwich style, and may be accompanied by a salad or French fries. Cafés serve coffee and sweets. Many Greeks find themselves in a café at least once every day. You are welcome to get a coffee and linger as long as you wish. (And in case you are wondering, Starbucks has made it to Athens). Cafeníos are traditional men's coffeehouses. These are becoming less common and are usually frequented by retired men as a social activity. Tipping is also known as a "service charge", and is included on your bill in Greece. The amount is set and controlled by the government. If you feel that the food or service was particularly good, then it is common to leave a small amount more. In touristy areas waiters are used to getting additional tips and have come to expect them. Use your best judgment here. A note about breakfasts: In Greek hotels your breakfast will be a buffet that can range from breads and jam to a huge assortment of meats, yogurts, cheeses, cereals, breads, honey, eggs, juice and tea or coffee.